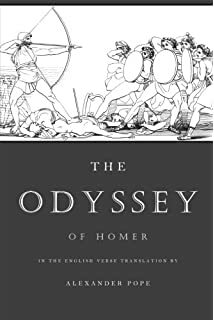 The Odyssey of Homer is a classic Greek novel about a man named Odysseus and his struggles as he tries to get home to his wife and child after the war. In this book, Odysseus runs into many problems, because of his own ignorance, or because of the selfishness of his crew. Throughout this interesting tale, we see Odysseus not only struggle to get home, but also struggle to find himself as he morals and values change on his journey. I loved reading The Odyssey, because it is not a simple book. While Odysseus' journey is fun to read, the language is difficult to understand, as well as the messages underneath. I loved reading this book, because it makes you think and has a lot of depth. If you don't like books with depth, The Odyssey is not the right book for you. However, if you like to read challenging books that not only have interesting stories, but a lot of depth, I would highly recommend it. This book was about Connie Lionheart, an eleven year old girl who is forced to move in with her aunt who lives by the sea. She soon meets a new friend, Col, and discovers that her aunt is part of a society who protects mythical creatures. She also learns of her own unique power, and the danger that accompanies it. I would recommend this book to those who like reading about mythical creatures, and to people who like animals in general. The book is told mainly from two perspectives, which may be appealing to some readers. This book is about Connie, a 12 year old girl who has a unique power with mythical creatures. She is the most important member of her society, and is in danger from the shape-shifter, Kullervo. Her parents; however, do not believe this, and send her off to live with her aunt and uncle. Col, Connie’s best friend, has his own set of troubles, mainly centered on his mother and her companion. I would recommend this book to people who like reading about mythical creatures, or animals in general. The book is told from 2 perspectives, so it can be a bit confusing if you don't like that. It is also full of twists and turns, and will keep you guessing throughout. In the sequel to Starcrossed, Helen faces many challenges and has to overcome obstacles in the Underworld. Being the Descender, she has to find a way to rid the world of the Furies, while also maintaining a normal life, for her father's sake. To top it off, she meets a new boy, Orion, and has trouble depicting her feelings for both him and Lucas. I loved this book. It was a little slow at first, but then the action kicked in and the ball started rolling. It was an amazing sequel. I would recommend this book to anyone who read the first book. I would recommend the entire series to any young adult reader who enjoys action, romance, and some Greek mythology. Starcrossed follows the journey of Helen Hamilton as she discovers who she is. She always knew that she was out of place, with her tall height, extreme strength, and amazing running skills, but she was never prepared for what she learned when the Delos family moved to town. It was an amazing book! I loved how she incorporated romance with Greek mythology! I would recommend this book to any teenager who enjoys reading about romance and action. It was the kind of book where you look forward to the next twist or turn in the plot!! Percy Jackson lost his memory. He finds a Roman camp (Camp Jupiter) in San Francisco and soon embarks on a quest with his new friends Hazel and Frank to save Camp Jupiter and Camp Half-Blood and release the god of death (the actual god of death. Read: Not Hades) Tatanus . Otherwise Gaea will awaken and destroy civilization. Yeah, just another normal day for a demi-god. He meets some allies along the way and soon faces the boss giant that he needs to defeat: the giant that's supposedly the bane of Hades, the one and only Alcyoneus. Call him Al or Golden Boy. Will he prevail or fail? Yes, I love myths and Percy Jackson stuff so this was a big hurrah for me. Percy Jackson fans can now celebrate cause Percy is BACK!! Sadie and Carter Kane are called upon to save the world. Again. Their job? Oh just journey across some lands to collect the pieces of the Book of Ra, awaken Ra, and stop Aphopis, the evil snake that's Lord of Chaos, from breaking out of his prison. Impossible, you say? Well, if you want to find out if they can do it, then read the book. This is the best sequel to any series that I have ever read! I would recommend this to all you Egypt mythology fans and Kane fans: Wait no longer. This book is so good that it will mesmerize you and pull you so deep into the story, you'll cry when it ends. The Iliad is a classic book that every student must read sometime in his or her life. Although very extensive in length and inclusive of historical details, Homer incorporates parts into his presumed poem that everyone will enjoy. From the runaway love affair of the beautiful Paris and Helen, to the fight for glory between Achilles and Hector, to the battle amongest gods and their patrons. This book is a good excuse to read some ancient history, without being stuck reading an actual history book. The biggest problem I had with this book, is that it was very long and very hard for me to comprehend. It is definitely a book that calls for a great reader with a lot of determination to complete the book. I would only recommend this book to those who seek after one of the classics or want to read about ancient Greek history. This is definitely the perfect book if that is the case; if not, and you are not someone who enjoys long books or history, I would not recommend this book. The only reason I read it was for academic purposes in which it was mandatory that I read it. Although I did not necessarily enjoy the book, I am glad that I read for the sake of achievement. I can now say that I have read the Iliad. Odysseus, a Greek veteran from the Trojan war, sets sail, returning to his home of Ithaca after 10 years of fighting in battle. After his ego comes out, however, Poseidon, god of the seas, is determined to keep him from reaching Ithaca. In the 10 years after the war, Odysseus is challenged by cyclops, witches, lotus, sirens, sea monsters, and the temptations of he and his crew that cross their path. This was my favorite book written by Homer that I have read so far. It is like the sequel to the Iliad, only tremendously more interesting. It is a love story between Odysseus and his wife Penelope and their dedication to each other as he fights his way home. Not only the romance, but the book also includes magical creatures and enchantresses and all sorts of Greeks myths, which I find very interesting. I would definitely recommend this book to others. It is a great book, especially for those who enjoy adventure, romance, the classics, and or fiction. This a book that combines all three genres. I was surprised that I liked it as much as I did, being that it was a book written by the author of the Iliad, which I absolutely despised. This is a book that I will always have on my bookshelf. Percy Jackson and his friends must go to the Sea of Monsters in order to save Grover and Camp Half Blood. There's a monster guarding what they need, making it the hardest quest they have ever received. I really liked it because Percy and his friends are brave. They take risks for each other; even Clarisse gets to be part of the team. The mythological gods help their children even though they may not see. The Gods are greatly involved trying to defeat Kronos. If anyone doesn't understand mythology gods they can read the Percy Jackson series. Percy Jackson makes it fun and easier to remember the myths. The world is ending. Soon. With Josh and Sophie Newman, two 15 year olds as the world's only hope, every side is battling for the twins to join them. Who will win? Read The Necromancer to find out. This book was really good. I loved the cliff-hangar endings and mythological references. Anyone who loves action-packed books like Rick Riordan's Percy Jackson series will like this one.